BATS!! 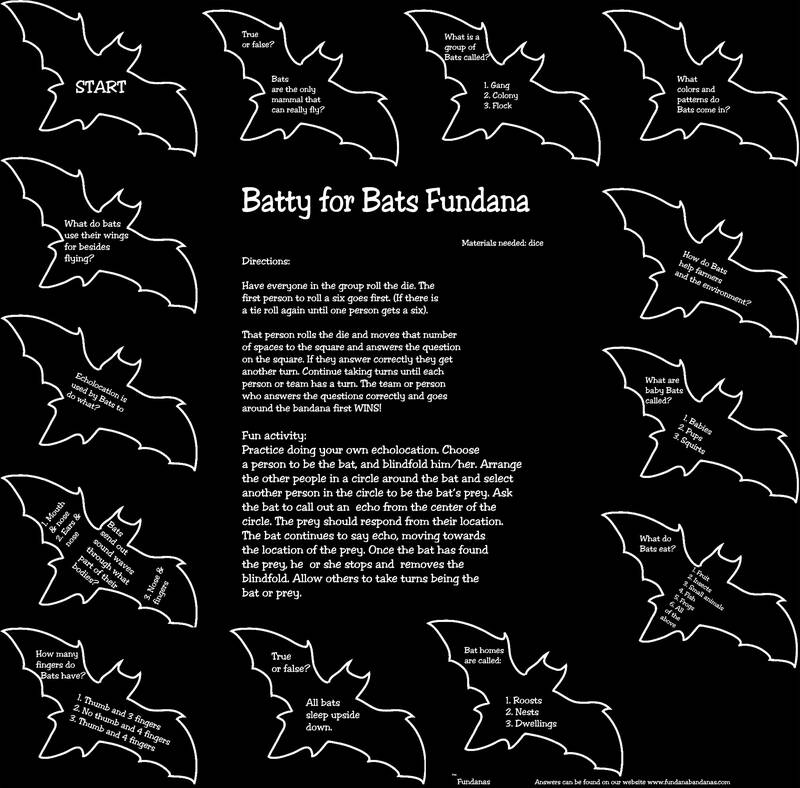 Learn all about Bats in a fun way with our Batty for Bats Fundana. Included is an activity about echolocation! Bats are cool!! 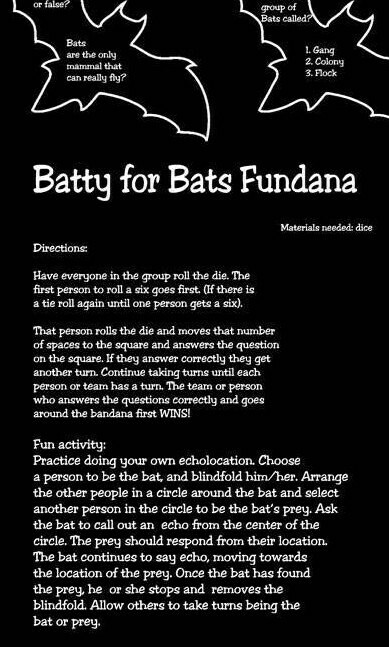 Try our Batty for Bats Fundanas. A fun game that will teach your child about the wonders of bats. 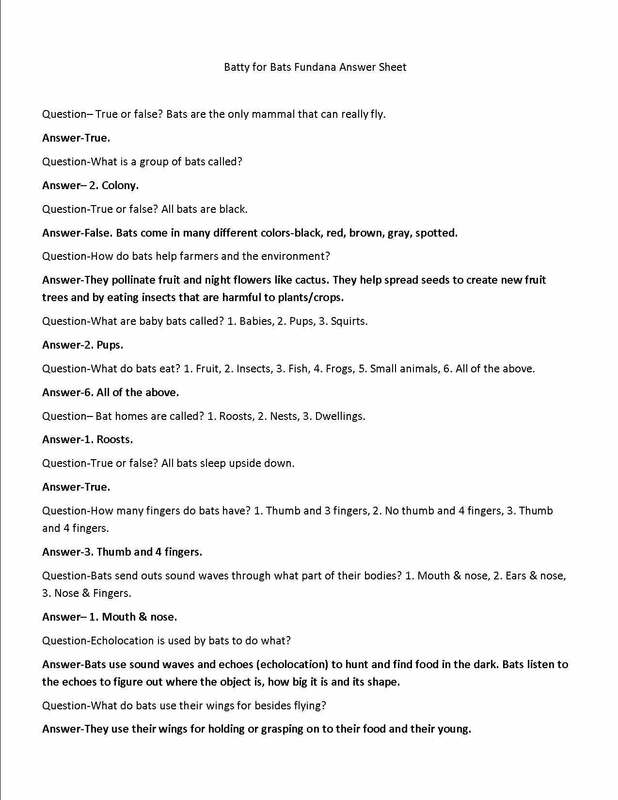 Questions about bats habitats, colors, what they eat, how they sleep and more! There is also a fun enrichment activity for kids to play about ecolocation on the bandana too! We have an answer sheet on our website so no worries if you don't know the answers! The Batty for Bats Fundanas are printed on a soft, black 100% cotton made in USA bandana. The Fundanas are designed to teach kids 3-adult to use their creativity, imagination, awareness of the natural world around them while learning and having fun in the outdoors! They are a great activity for kids of all ages and for school, camps, Project Wild Workshops, fundraising, homeschoolers, scouts and more! We do offer a special price to Teachers and Scouts. Please contact us at fundanas11 [!at] gmail.com for more info.